The Ritz Carlton ® is known for its high quality of bedding and pillows. They are specifically designed for their bed experience to ensure that guests are surrounded in comfort and luxury. The Ritz Carlton is known for carrying an assortment of bedding that will optimize comfort and give you the best night’s sleep. We carry a variety of pillows, comforters, blankets, and featherbeds that are featured in Many Ritz Carlton ® Hotels. 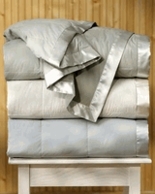 Optimize the most comfort in your bedding today and purchase your bedding.